Tartelette: Chili Oil & Blood Orange Grilled Shrimp With Marinated Zucchini Salad. 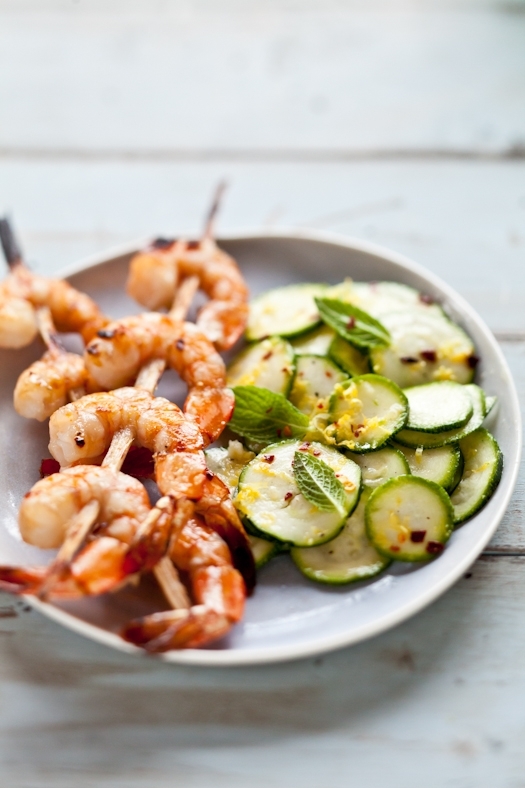 Chili Oil & Blood Orange Grilled Shrimp With Marinated Zucchini Salad. Due to many requests and emails, Clare and I have decided to open two more spots to our Gulf Shores Food Photography & Styling Workshop, April 25th-29th. It sold out fast but we have room and plenty of brain power to accommodate and teach two more people. For more info, click HERE. Cooking for one can be challenging. Not because recipes are often written for 4 or 6. For me they are a fast realization that I can't share my favorite things with my mate. During the week, I live of big pots of soups filled with lots of root vegetables, plenty of herbs and a bit of protein I cook and add separately. It's nothing glamorous but it's good and it fills the house with familiar flavors. I also make big batches of ratatouille that I simply top with shavings of parmesan and a poached egg. Any leftover anything is greatly highlighted with an egg on top, in my opinion. Week like this week, could prove challenging to get something nutritious on the table if I were neither a bit organized nor desiring to feed my body right. Let's face it, and you know it, everyday can turn form nice and mellow to high pressured and brain frying. It's always nice to come home to something one can reheat or fix in a flash. While I try to get a big pot of soup on during the weekend so I can have some ready to eat when I get home, sometimes, I find myself in the mood for something else altogether. Composed salad are always my second best choice. Lots of greens, roasted vegetables, flavorful grains and a protein of some sort. Kale, roasted beets, quinoa, wild rice, salmon, soft boiled eggs, grilled steak. Everything makes its way into a salad. Or a soup. Small batches of Pho, oxtail stew, salmon chowder. It's micro cooking all over again. And if you like preparing food, shopping, chopping, dicing, sauteing, mixing, well, you still like cooking for one. Even if it means, a quiet evening, one bowl and some leftovers. Sometimes, I just get a bit more fancy with my time, especially when I get home a bit earlier than anticipated and take a few minutes to marinate, assemble and grill. And still have leftovers to come home to. The latest issue of Donna Hay had the most tempting marinated zucchini salad and while inspired by the dish, I did not follow the recipe to a T. I paired it with some simple chili oil (from the roasted okra in this post) and blood orange marinated shrimp that I thread on fresh sugar cane sticks. They add a bit of sweet contrast to the oil in the marinade and pair perfectly well with the mint and pepper of the marinated zucchini salad. Place the shrimp, chili oil, juice and zest of the blood orange, salt and pepper in a non reactive bowl and marinate for about an hour in the fridge. 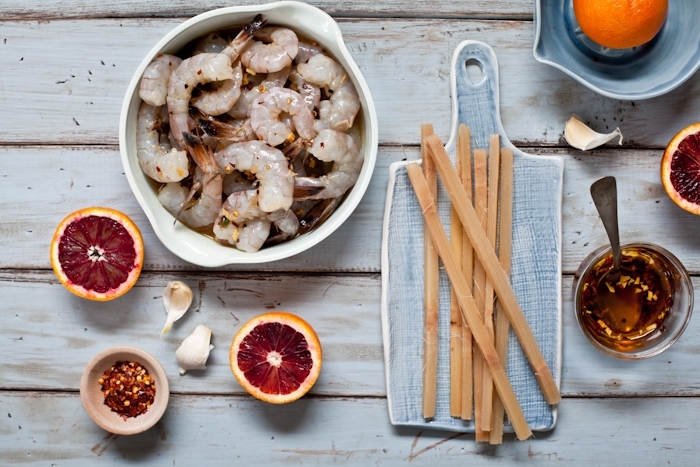 Discard the marinade as you thread the shrimp onto your skewers. Preheat the grill to medium high and grill for about 2-3 minutes on each side. Serve with the marinated zucchini salad. Place all the ingredients in a non reactive bowl and let marinate together for at least one hour prior to serving. Eat cold or at room temperature. Wow it all looks so delicious and appetizing! Easy and delicious. Pictures are perfect. Shrimp and zucchini are just wonderful together. The marinate, chili, orange, mint leaves...makes it even more wonderful! 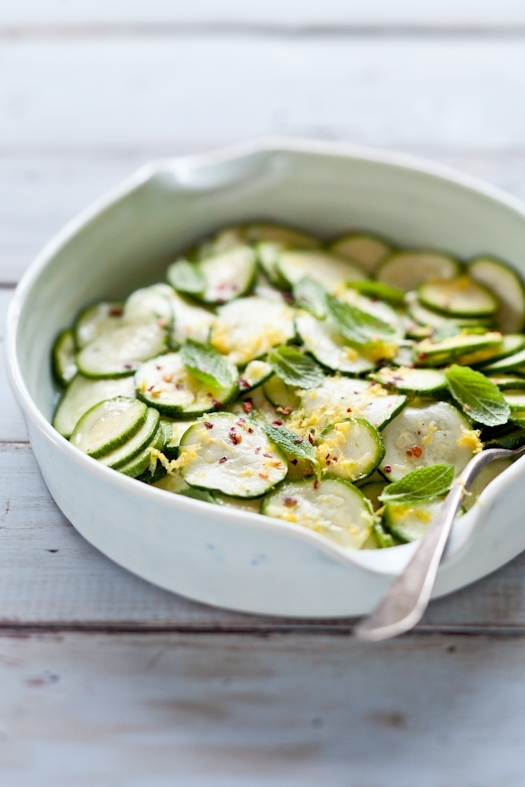 I love the idea of the raw marinated zucchini salad. I love zucchini raw, it has such an interesting flavor! I'd love to try this recipe! What a delectable-looking meal! I love the combination of spice from the oil and the sweetness of the orange. You mentioned the chili oil came from roasted okra -- do you have a post on that? And I agree -- on days that I have some extra time after getting home from work, I can't think of a better way to spend the evening than to cook up something "fancier," like you mention! Do you have a recipe for Pho you could share sometime? I'd love to make that at home. It looks really divine! I cannot wait for the zucchini season to start so I can try this recipe, miam! Wow, that looks so great! Thanks for sharing. What a colorful and palate popping combination! A lovely post.. I cook for one as well and I have to say how much more enjoyable a meal for yourself is when you put your time, care and passion into it such as you have here... lovely! Looks delicious! And beautiful photos as always! Christine: Steamy Kitchen's recipe for Pho is the one I use all the time. Judy: you might want to refresh your browser or clear your cache because I am able to pin from different computer/accounts. Thanks! Looks wonderful. I, too, have trouble cooking for just myself on the rare occasions I am home on my own. This salad looks like just the thing to keep in mind for those times. Thank you so much. So tastful on your photos! perfect and beautiful as always! this recipe looks really good, i definitely have to try it! Can't wait to to make the blood orange recipe! 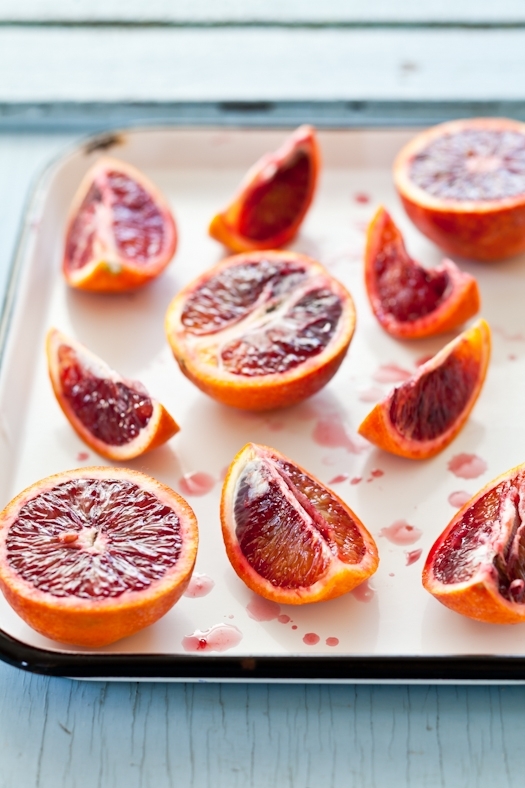 It's all about blood oranges this month. Just posted a blood orange recipe on my blog! Thanks so much for all the inspiration! It just looks desperately delicious!!! I want some NOW! =P pheeeew! I must admit I'm not that keen on zucchini but having tried this out I've hanged my mind! I'd not eaten them raw before. Love blood oranges, it's pity you can't always get them.